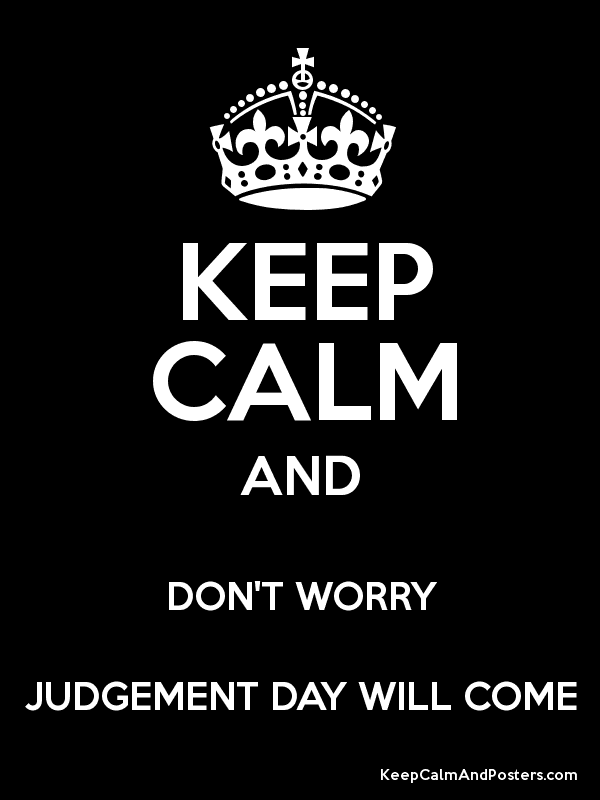 Judgement Day. That day when the trumpets will resound, the earth will cease to exist the way we know it today, and the Lord will make His way to use on a chariot of white steeds. It’s a day that believers see to equally anticipate and dread and it seems as we get closer to Christmas, the return of Jesus our human mind turns to the concern about what will happen when this actually occurs. Our church has discussed this topic a good deal during the Advent Season. It makes sense. Here we are a mere 10 days from the celebration of the birth of our Savior and it’s only logical that we talk about what happens next. I must confess, however, that the more I listened to the messages about this fantastic event, the more I had to wonder if the idea of a judgement is truly a God-inspired thought or the result of the mindset of the Gospel readers. During my time studying at various biblical and non-biblical schools throughout my life it has been made pretty clear that the disciples, even to the end, had a hard time reconciling the idea of a peaceful savior. They, like us, were looking for a military leader; a King to come and destroy their enemies and put them in a place where they felt honored and respected. They wanted to see those who had been oppressing and enslaving them crushed so they could smirk in cool satisfaction as their cries were finally heard and their prayers answered. Maybe they, again like us, were hoping to see the roles reversed so they could treat their oppressors as abusively as they felt they had been treated. Of course this is understandable. Of course those who have been enslaved ache for redemption from the horrendous life they have lived but the dividing of good versus bad as described by John in Revelation feels, at least to me, more like a human desire than a Godly vision. Let’s just take a moment to look at it. If we as Christians have truly been saved from our sins; if all of our wrongs have been made right do to our faith in Christ; if our hearts have been changed and we, despite daily failures, are striving to serve the One we love and worship (some days more than others, of course), what then will we be judged for on Judgement Day? Will God be holding court for all of us individually, as represented in the movie Defending Your Life? If so, then God is just as hypocritical and passive aggressive as our worst enemies. You may think I’m must being blasphemous, but I truly think the Bible supports me in this. According to Psalm 103:12, the Lord promises to move our transgressions as far from us as the East is from the West. He’s already forgiven us and forgotten the things we have done. Well, actually, He knew we would do them before we did them, had already forgiven these actions by the time we asked for forgiveness, and has directed our paths from that point forward so we can be where He wants us to be now. Unlike our human mind, God is actually able to truly forget the evils we have done in the past and does not need to remind us of them. It’s not as if He’s going to show us all of our worst moments and say after each one of them “I forgave that one…and that one…and that one…” My God is not a god who thrives on humiliation nor does He want us to feel guilt for things that have been put in the past. The God I believe in wants to rejoice with us for being with Him; for making the choices we made so we could learn the lessons we needed to learn. I have already been judged and forgiven. It’s done. Okay, you say, so maybe He’s judging the non-believers or the murderers or the rapists. He’s judging those who do heinous, unforgiveable acts here on earth. Well, in theory, I get that. But hasn’t He already done that? Assuming that He needs to wait until the end times assumes that He lives in the same linear fashion that we do and therefore won’t know the condition of our hearts – our choice for or against faith – until the day we die or the day of His 2nd coming but to believe this flies in the face of who I believe my God to be. My God already knows the condition of my heart and those around me. Despite our humanity and all of our sinful actions (and mine have been far too many to count), He knows what we truly believe and what we don’t. He knows each and every choice we will ever make and He knows the end result of our lives. Only He knows what will happen to those who fail to acknowledge Him and I don’t believe that part of that plan is for us to be all standing in one room watching while perhaps those we loved while here on earth are sent away from us for eternity. That would only cause us pain and the Bible says that there is no pain in heaven. Isn’t that one of the things that defines heaven? …at least from my humble perspective. God has created each of us with the ability to seek Him and become like Him. It is His greatest desire we will seek Him, fall in love with Him, and seek to serve Him in every way we can. Perhaps He gives us all the time we need in this life – and maybe even others (gasp!) – to find our way to the right place. Regardless, I believe that if indeed there is a final day, the Lord will come to us the same way He did before…and the way He told us He would come. There will not be trumpets blaring or cymbals crashing. There will be no 7 horsemen or destruction of the evils of this world – at least, not by God. We will not know the day or the moment. He will come as He told us He would throughout the New Testament….like a thief in the night. He will not come to shatter, crush or destroy but to heal, restore and bless. And this, my friends, is the kind of second coming I can truly rejoice in. Are you a glass half-full or a glass half-empty kind of person? I like to believe I’m a glass half-full person, but at this time of year, I think I become far more of half-empty type the closer it gets to Christmas. There are so many things I think I’m needing and missing that at other times of the year don’t even cross my mind. I blame this on the sappy-sweet storylines of all the Christmas movies. Now don’t get me wrong. As you know, I love Hallmark movies – the sentimentality, the warm-heartedness, and the campiness of these movies. But as you are probably aware, the movies produced by this excellent organization will also acknowledge that there is a problem with these charming tales. In the world of Hallmark, this time of year has an amazing magic which makes even the most unattainable hopes and wishes come true. Everyone gets exactly what they wish for every single Christmas despite the cost or sacrifice that needed to be made to have this happen, all relationships are not only repaired, but bettered, all money issues solved, and all loneliness eliminated because “that’s what this time of year is all about”. And yes, there’s also the absolutely perfect dusting of snow that must be present regardless of where the movie takes place because what is Christmas without the perfect snowfall? Like it or not, all of us have likely fallen victim to this Hallmark fantasy to some degree or another. We put up the decorations, buy the ugly Christmas sweaters, spend hours shopping for just the right present and feel certain that when we have done all of this just right, we will have bought the right to get all of our hearts desires fulfilled but, as I’m sure you’ve discovered, we do not live in the Hallmark world. All of the decorations, presents, ugly sweaters and Christmas cheer will not magically make our lives fit into our favorite holiday movie. God doesn’t suddenly become Santa making sure to give all of the “good boys and girls” the gifts they long for and hard as it may be to accept, just because the holiday season appears on the calendar, all of our burdens are not magically lifted from us – not even temporarily. As a matter of fact, the struggles we feel during the ordinary days of the year are often magnified during the holidays. Maybe this happens because we buy into the images others project about how perfect their holidays are and we assume that we have somehow failed at the whole holiday celebration thing – or maybe even life itself. Or maybe we feel in some way that we are being punished for choices we have made in the past or that we are somehow not worthy to have the same joyful experiences others to do. Maybe we used to have those perfect holidays but the person or people who made it special have died or have been otherwise separated from us and we are left feeling isolated, broken and alone. To be honest, I have struggled with feelings like this through the years. My home was rarely a place of safety let alone joy and since my birthday also falls during this Christmas season, my “special day” was often lumped together with other celebrations or forgotten all together because of the overall stress and busyness of the season. I have longed to find the “perfect person” to spend holidays with and have sought ways to celebrate the holiday that would make me feel the way I think others must be feel because it’s what I’ve seen in all the Hallmark movies but that “perfect holiday feeling” remains elusive – and there’s a good reason for that. The reality is that the images floating around in my head – and maybe yours, too – about how Christmas and my birthday should be are probably just figments of my imagination – no more real than the snow falling in Tampa at the end of a Christmas movie. Much as I wish things could be different, life is not nor will it ever be a Hallmark movie. There are no perfect endings or nice, tidy ribbons to tie up loose ends. To make matters worse, none of us know what the future will bring any more than we can go back and change the things of the past. All we can do is choose how to move forward. So what does that mean for Christmas this year and in the years to come? For me, it means that I have chosen to put away the cynicism that has grown in my heart over the years due to years of unmet, unrealistic expectations about special events and celebrations- and I’m starting with Christmas. To make this happen, I am choosing to try to see Christmas through God’s eyes instead of my own. What does Christmas look like to God? As I see it, it’s not about the lights or ceremony. It’s about a loving Father watching His only Son being born – rejoicing in birth while simultaneously grieving the path His only Son must take in order to fulfill His perfect plan. I imagine Jesus at once a newborn taking in the sights and sounds of the cold, star-filled sky while also understanding His purpose for this journey and experiencing fear and sorrow. I imagine Mary, Joseph, and all those who came to see this miracle in a manger looking on with awe and wonder knowing they had been chosen to be a part of something so much bigger than they and knowing this moment and all to come were completely out of their hands. Looking at Christmas through God’s eyes I am reminded that every single one of us was placed here on this planet at a specific time for a specific purpose and that even in the times of heartbreak and loss, we are perfect in our imperfection; loved more fully than we can ever imagine even when we feel the most unlovable and none of this love has to do with how we decorated our homes, what festive clothing we wore, or what presents we purchased for others. My prayer for each of you during this Christmas season is that you will find a new sense of awe and wonder about Christmas and feel anew the amazing love that God has for each and every one of you which led to His bringing His son here to save us. Kierkegaard once stated that life is best understood backward but must be experienced forward. I think this may be particularly true about travel. While I am not “globe trotter” by any definition, I can say that as I look back on the places I have been blessed enough to visit, it is clear to me that those places that left an indelible mark on my heart – those places I long to return to and hold a special place in my memory – are places where I felt inspired and at peace; where I felt as though the hold this planet had on me was not as strong as the connection I had to the home waiting for me in eternity. Such places, it turns out, have been identified for years and are known by the Celtics as “thin places”: places where the distance between heaven and earth collapses and we’re able to catch glimpses of the divine. Finding ourselves in these thin places does not necessarily lead to life-changing spiritual breakthroughs, whatever that may look like, but they can disorient us; confuse us. We can find ourselves jolted out of old ways of seeing the world and more readily accept the world as God sees it. I believe many of us seek these “thin place” experiences over and over once we have experienced them and are often disappointed when we can’t find them again. We go back to the same place at the same time of year and day but somehow, it’s just not the same. The connection to something beyond us has disappeared and we can easily become disappointed with God as a result. Thinking about these times of wonder and disappointments, I find myself wondering what is it that truly creates those amazing moments? Is it truly the place? Is it a rip in the fabric of time that is only visible at exactly the right time in the right place? To me, I think that these moments occur not because of the physical location or time, but because of the condition of our heart at that moment; that we find these thin places in times when we are thoroughly focused on God and His will for us instead of being distracted by our personal wants and needs. I would go so far as to say that the “thin places” are times when we land on that narrow road that Christians and others of faith are called to walk upon. 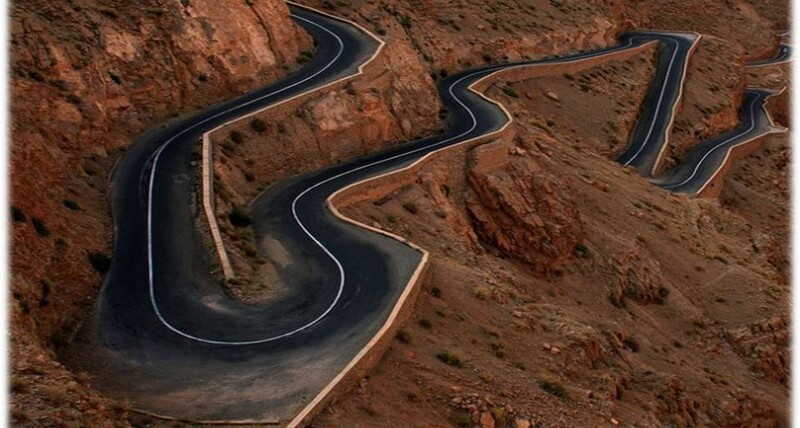 That road is, as you have probably come to know, very difficult to find let alone stay on. I personally imagine this road to be almost as narrow as a tightrope; a place we need to truly focus in order to stay balanced upon it and a place where, more often than not, we simply stumble upon rather than encounter purposefully. The forces of materialism and selfishness pull us from side to side and we tilt, stumble and often fall. But occasionally all the pieces fit together and we find ourselves centered, focused on God and His path for us. We’re able to do this when we love as He does; love one another without boundaries, accepting all of the people God places in our lives for the individuals He created them to be regardless of their thoughts, beliefs, words or actions; when we love them despite how challenging they may be from our human, selfish and judgmental perspective. When we have those moments of truly loving those around us, the desire to get stuff or reach for the next rung on the ladder falls away and the distance between heaven and earth narrows. The thing we each need to remember – or at least I need to remember – is that in order to narrow the gap between heaven and earth, we have to focus purely on God and His will for each moment of our lives. This is, to say the least, challenging. We are fed a non-stop barrage of the things we “need” to be truly happy. It seems that no matter where you look, we are told our lives are empty, unfulfilling and a disappointment to us and those around us. We get caught up in the “keeping up with the Joneses” mentality of having to make more money to buy the right stuff to fit in with the right people and live in the right place. It’s not just exhausting, but it is truly a never-ending process. The reality is there will always be someone else who makes more or has something that looks really cool or that lives in a house that is what we consider to be the epitome of success and continuing to focus on the things we don’t have not only takes our eyes away from God, it furthers the frustration, bitterness and anger that is so pervasive in our world today. As people of faith, we need to remember to change our focus from the material to the ethereal. When we do this, we may indeed find ourselves in one of those special “thin places” more frequently, but even if we only find these places once or twice in our lifetime, working to separate ourselves from the worldly negativity and focus on reflecting God’s perfect love to those around us will keep the memory of these times alive and help us find balance in the more difficult moments in life. Wow! That escalated quickly, right? This election season was so full of hatred and vitriol that was spewed back and forth, it’s no wonder our entire nation seems to be suffering from PTSD in its wake. As we all know, however, the end of the election did nothing to actually stem the hatred, but rather has given fuel to it. Marches, riots and random beatings are rampant. What is odd – at least to me – is the side that professes to want peace and unity is the side that is promoting and engaging in the violence. This is not only contrary to everything they profess to believe in, but is doing nothing to solve the problem. The more information I get about the election itself, the more disheartened I am by the entire thing. I am shocked that this outrage exists when only 51% of registered voters actually participated in the election. I am heartbroken by the level of anger and hatred that is continuing on my Facebook feed by members of the losing party even though their chosen candidate has been nothing but gracious in her concession speeches and posts. Perhaps most of all, I am saddened by the fact that the information that people are a majority of people participating in this violent behavior are basing their actions on the things they read on the internet and the sound bites they have been given by the media – an entity that is far from unbiased and fair in it’s depiction of any of the candidates that participated in this election. In case you haven’t figured it out yet, the media thrives on fear. They seek out the frightening and horrifying items that happen around us rather than those things that are positive and loving. They incite fear of our neighbors, our leaders, and our country as a whole. I’m sure there are many of you who are shouting at the screen now, angrily saying that the news provides information that we need to know to keep ourselves safe and protected from the horrific world around us. I get it. I’m all for information, but all information must be vetted. We must understand the biases of the given source and do our own research to understand fully what is happening rather than taking the 30-second tidbits of information that are given to us from others. The problem isn’t that we aren’t intelligent or learned enough to vet the information given to us, but rather that the information given to us is so targeted to enhance our fears that we become paralyzed by fear, unable to do our research because we are afraid of what we will find. The reality is that fear, not hatred, is the opposite of love. Fear drove Adam and Eve to hide from God in the garden of Eden and fear drives us each into hiding from one another because, ironically, hiding makes us feel safer. As I watch the coverage and read about the outcries of those angry about the election results, all I hear are fears of what may come with the new presidency. We don’t actually know what will happen, but are acting out in fear of what could possibly happen – fear of losing healthcare, fear of losing freedoms, fear of losing money, fear of being seen differently or being treated differently because of who we are. But we have a choice to act differently. We could – and are called, as members of faith – to choose to act in love instead. Choosing to act in love toward one another doesn’t mean that we think the same way or that the differences we have are wiped clean. It just means that we allow God to direct our actions instead of allowing our human nature to get in the way. Scripture tells us that love bears ALL things and that we are called to love ALL people. Neither of these statements means that we are to love only those things and people we like and believe in. Anyone can do that. We as members of faith communities – Christian and otherwise – are called to love even those with whom we significant issue. Recently, a member of my family moved back to town. He is a person that abused me sexually, verbally, and physically. There are many in my life that told me I should have nothing to do with him; that I should not even be speaking to him let alone have a relationship with him. I get it. I really do. Loving this person is painful and challenging. Spending time with him brings back memories I don’t wish to recall. It would definitely be easier for me to slam that door and nail it shut so I never have to go down that path again, but the thing is that in order to be the person God desires me to be, I don’t really have that option. Now don’t get me wrong, there are strict boundaries and safety nets that are in place and need to remain. Being loving doesn’t mean I put myself in harm’s way, but if I am to be a truly Godly woman, I am called to love this person and all persons who God places in my path not because of who they are or who I am but because of who GOD is. Loving those around us is not a consumer event. It’s not about what each of us gets as a result of the activity. To truly love someone the way God intends us to means that we don’t get the luxury of keeping score or holding back because it feels better or is more convenient. We as people of faith must be willing to stand as witnesses and participants in loving the way God intends us to love because we are the only ones who can show others the way to peace and the way to joy. The bottom line is this. God is love. Period. Not God is love except….or God is love but….no. God is love. End of sentence. In this time of uncertainty and change, being God to our hurting world is even more important that it has ever been. Love must be at the center of all of our actions if we are to move forward. We can’t say, “yeah, but look at what he/she said or did! How can I love them?” That is not love. Love is being merciful and generous despite what the other person said or did. This is how God is able to love us despite the despicable things we say and do and it is this unconditional love that we are called to show one another.